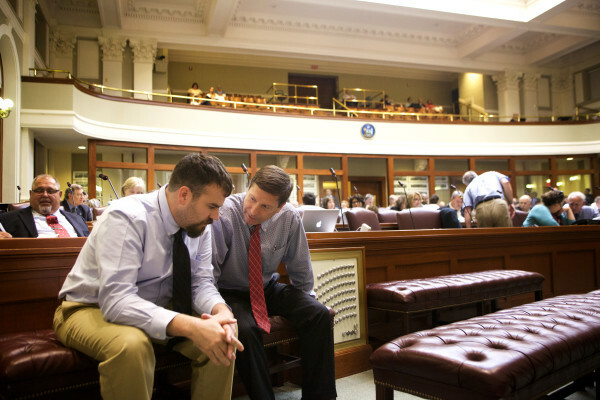 House Majority Leader Jeff McCabe, D-Skowhegan (left) and House Minority Leader Ken Fredette, R-Newport, talk before the House passed a two-year budget early Wednesday morning in Augusta. Maine lawmakers have sent a two-year budget bill to Gov. Paul LePage’s desk, doing their part to keep state government operating. It was a budget deal that was sealed because it was practical — as in, little in the document was earth-shattering — and sufficiently palatable. Given that reality, it’s important to recognize what the budget is and what it isn’t. It’s vastly improved from its starting point. Lawmakers from both parties delivered a much better budget than the one LePage gave them. The governor’s proposal offered a faulty tax overhaul, set the state up for an imbalanced budget two years from now, ended or drastically cut back key state programs that keep property taxes in check, and offered lawmakers disingenuous choices as a way of shifting health and human services spending to populations the LePage administration deems more deserving of help than others. But lawmakers largely improved the LePage budget proposal simply by voting no on a number of change initiatives and upholding the status quo. The budget does contain additional funding for public schools, boosts funding for Maine’s universities and community colleges, includes an investment in new workforce training and expands need-based scholarships for Maine college students. But none of these investments — some proposed by LePage and some added by legislators — on its own is ambitious. They maintain operations at the state’s public schools and institutions of higher education. That’s helpful, but the budget reimagines nothing. It doesn’t set Maine on an ambitious course to become a state that’s, say, best in the world at fostering small business growth or, perhaps, best at training 21st century workers. The reality of the budget situation meant deflated ambitions. It’s not a budget defined by its income tax changes. LePage has been hyper-focused on cutting, then eliminating the state income tax. Indeed, income tax cuts became one of the last sticking points to be negotiated among legislative leaders before they reached a final budget accord. In the end, Republicans got some of what they wanted — lower state income tax rates, especially the top rate. But they shouldn’t be celebrating such a small victory as a meaningful change that will spark economic growth in Maine. The tax rate changes are small; they’re probably not enough to affect taxpayers’ behavior one way or another, especially the activity of small business owners. Then, the new tax arrangements mean deductions virtually are wiped out as taxpayers’ income rises, potentially canceling out the benefit of the lower top tax rate Republicans sought for middle- and higher-income taxpayers. Republicans also won on the estate tax. As a result, Maine’s estate tax will kick in at about $5.5 million in value instead of the current $2 million level. But this change affects so few people that no one can make a straight-faced argument that this is an economic victory. In 2013, the federal estate tax — whose parameters Maine will now share — applied to 32 Maine estates. Of the 153 estates subject to the Maine estate tax that year, 54 percent belonged to non-Maine residents, meaning an estate tax cut can be a windfall for the heirs of wealthy people with Maine vacation homes. Exceedingly few estates — at either the $2 million or $5.5 million exemption levels — are farms and small businesses whose ability to survive is put in doubt by the estate tax. Fortunately, it’s a property tax-conscious budget. While the budget includes several tax changes that are backwards, unnecessary or meaningless, the final deal at least is conscious of high property tax burdens. It increases the Homestead Exemption instead of eliminate it for everybody but seniors, as LePage proposed. That means a greater portion of resident homeowners’ property value will be shielded from property taxes. An increase in school funding also can help to contain, or even reverse property tax increases. And the budget maintains revenue sharing for towns and cities — albeit at a lower level than prescribed in state law — instead of eliminate it as LePage proposed. Those are laudable provisions in a deal that offers little worth celebrating.